BB Chronological 32: Big Bang #16 – Alakazam! 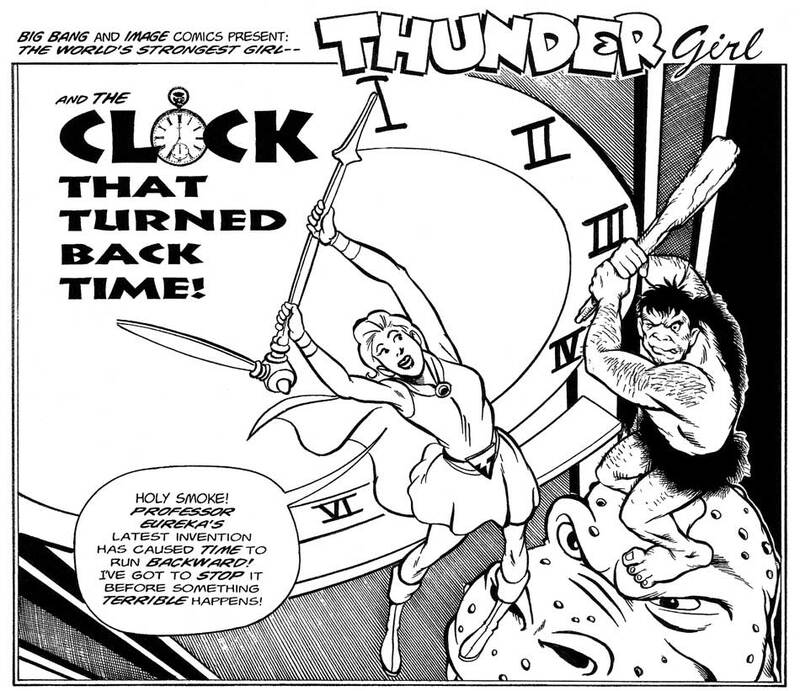 The front cover of Big Bang Comics was drawn by the late, great Bill Fugate and promises a Thunder Girl story entitled “The Land Of Long Ago.” Yet, when you flip open the cover, there is the World’s Strongest Girl starring in “The Clock That Turned Back Time.” Huh? What gives? Here’s what happened. Bill Fugate wrote and drew the story that accompanied the cover, but was going through a rough stretch in his life at the time and was locked out of his apartment by an S.O.B. of a landlord who threw away all of Bill’s stuff, including the afore mentioned story and art. All this about two weeks before the issue was due at the printer. 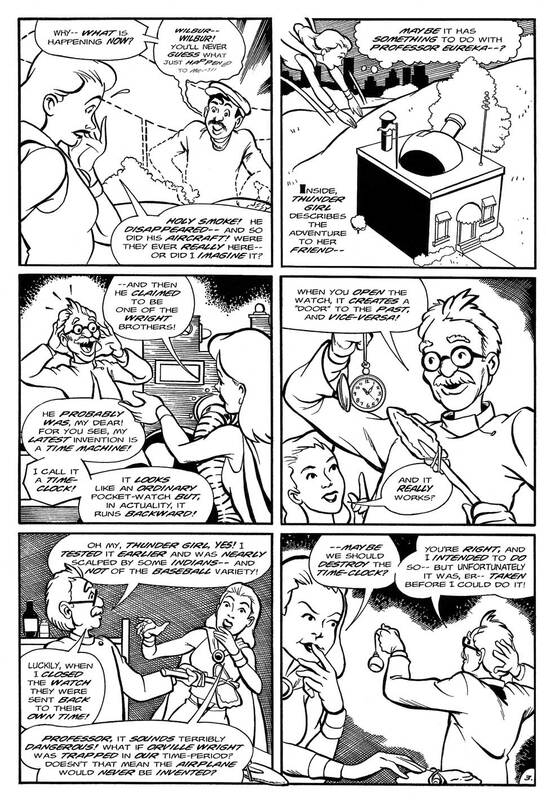 “The Clock That Turned Back Time.” Tim Stiles jumped in to pencil the story, which was lettered and inked by Shawn Van Briesen and his late studio partner CHAS. Two weeks later, we were at the printer. While I’m sure it was nothing like what Bill had done, it’s a fun story. Thunder Girl’s pal, inventor and scientist Professor Eureka has invented a time machine in the shape of a pocket watch. Unfortunately, the watch was accidentally taken by the Professor’s assistant, Handy Andy who went out to run some errands, and every time he checks the time he opens a portal that lets in time travelers from times past. As T Girl searches for Andy, she runs across the Wright Brothers, some marauding Vikings and a Brontosaurus before the watch is accidentally broken. The artists did a wonderful job on the art, especially in such a short time. 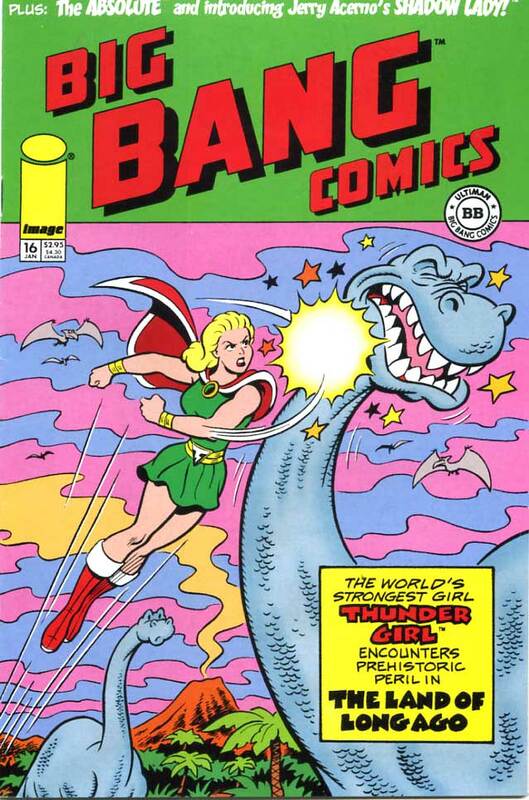 And I believe it was the first story in which Thunder Girl wasn’t drawn by Bill Fugate. 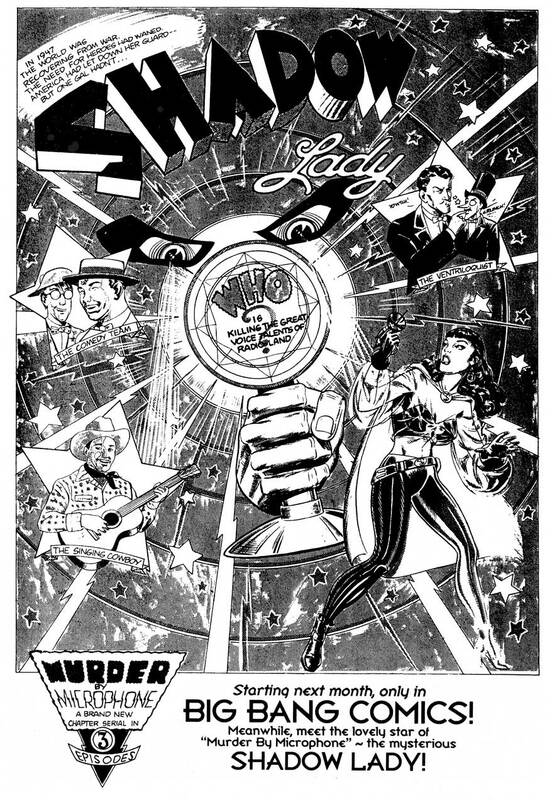 The second story in the issue is actually a preview of the three chapter serial “Murder By Microphone” set in 1947 written and drawn by Jerry Acerno, starring his wonderful Shadow Lady! In it, our mysterious heroine is interrupted as she gets ready for a date by a jewel robbery across the street. She jumps into action as the Shadow Lady and chases down the bad guys, only to leave us wanting more in a cliff-hanger ending straight out of a movie serial. She returned in the next issue, BB #17, so there will be more about the Shadow Lady next time around in this blog. As for Jerry (he also goes by Gerry), he began in the 1980s as an inker for DC and Marvel, moving into animation in the early 90s, doing storyboards and art at Disney, Dreamworks and others. The third tale in this issue features the return of the hero known as The Absolute by writer Daniel Wilson and Big Bang Hall-Of Fame artist Darren Goodhart. He was last seen in Big Bang Comics #11 (go ahead – check back to the blog on that issue to refresh your memory). This time around, The Absolute is in police custody for an assassination attempt on Senator Gus Garrett. As the cops grill him, the former hero breaks free – – only to be stopped by the real Absolute! He tells the astonished prisoner that he is merely a clone, grown from cells stolen by a group called Biohost. During a struggle, the clone is shot and killed by the police and the Absolute is handcuffed and taken into custody. Lots of fun and definitely in the vein of Archie Goodwin and Walt Simonson’s Manhunter run. 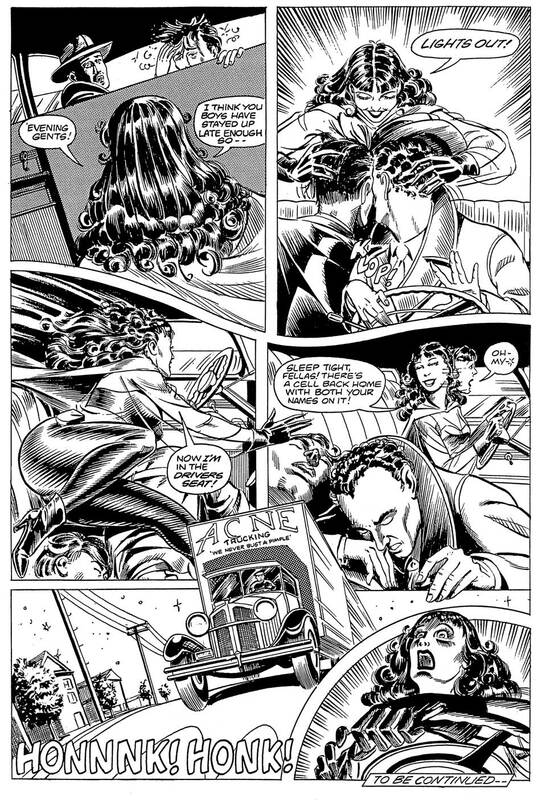 This issue also contained a Who’s Who page about Ryan Brown’s character Bog, who appeared in the previous issue. I already reprinted that page in my blog last time about BB #15, so you can see it there. Next up is one of my favorite pieces to ever appear in an issue of Big Bang Comics. 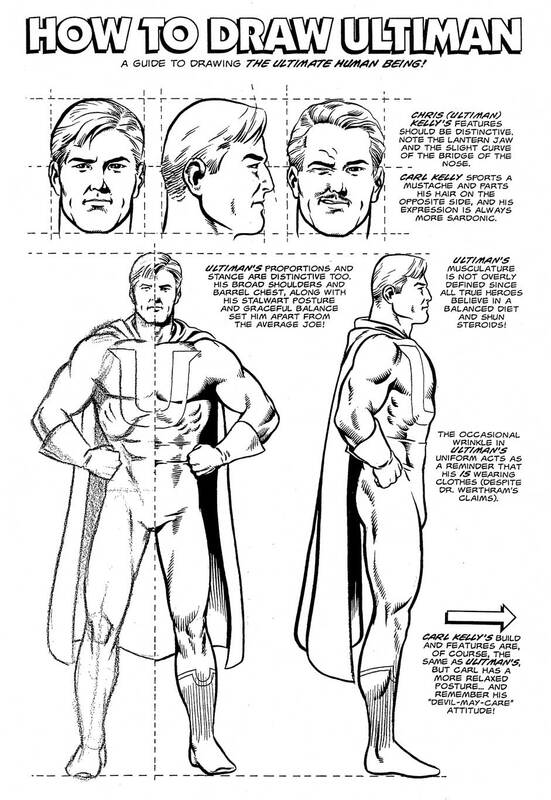 It was the 2-page “How To Draw Ultiman – A Guide To Drawing The Ultimate Human Being!” by THE Ultiman artist, Jeff Weigel. I’m reprinting the first page here – – I highly recommend picking up the issue to see the second page. 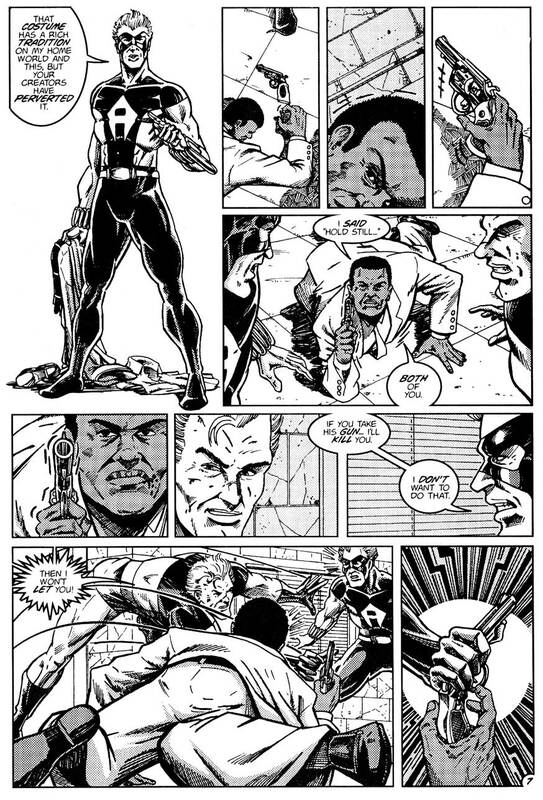 As much as I love Jeff’s Ultiman, I absolutely adore his rendition of Carl Kelly – Ultiman’s jackass of a brother. 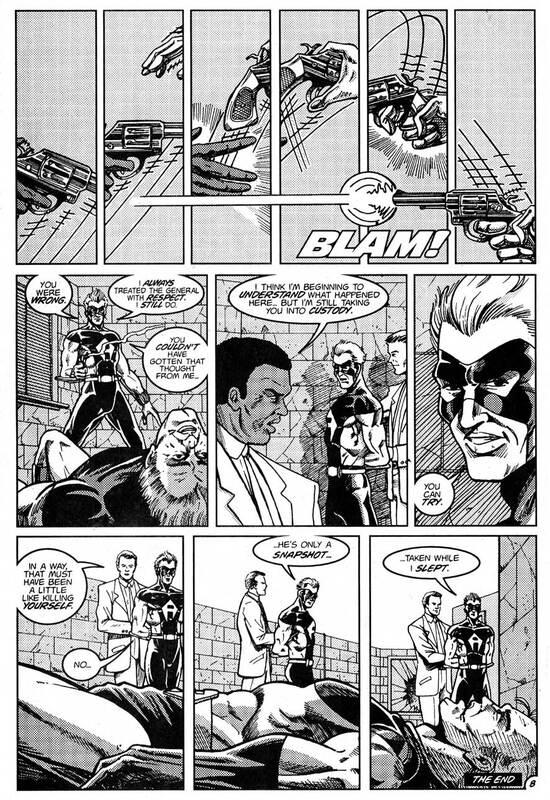 When Carl died in the comics, Ultiman adopted his guise as a secret identity to escape from the grind of being a super hero 24 hours a day. And in case you didn’t know, Jeff Weigel is currently drawing the syndicated Sunday Phantom comic strip and it is gorgeous! 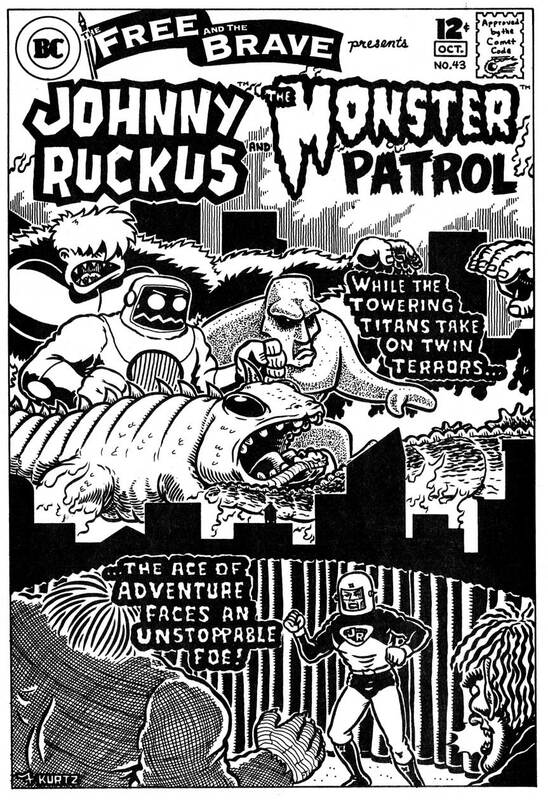 Rounding out this issue was a team-up between adventurer Johnny Ruckus and the Monster Patrol. 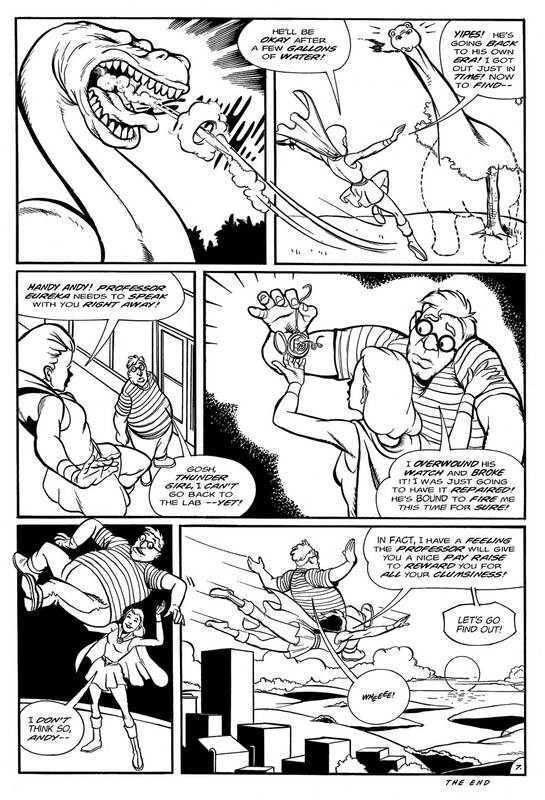 While on patrol, Johnny Ruckus runs across a vampire who escapes by turning into a bat and flying away. Johnny heads for Monster Mountain, home of his old friend Dr. Paul Malone, the man with the most knowledge of monsters in the world. Malone introduces Johnny to the members of the Monster Patrol: the yeti Dr. Bigfoot, stone icon Kona, the amphibian Neptus, Xorkarr and the Doctor’s beloved robot, Martha. Dr. Malone mentions the sighting of a werewold the night before, and Kona, watching the television, points out that the sightings match the movies that had shown on the TV show Dangerous Spooky Theater the past two nights. That night’s movie is “King Klung Vs. Gorzilla”, and the two giant monsters turn up in the city. The Monster Patrol go to battle with them while Johnny Ruckus heads for the TV station to stop the mystery man there.. 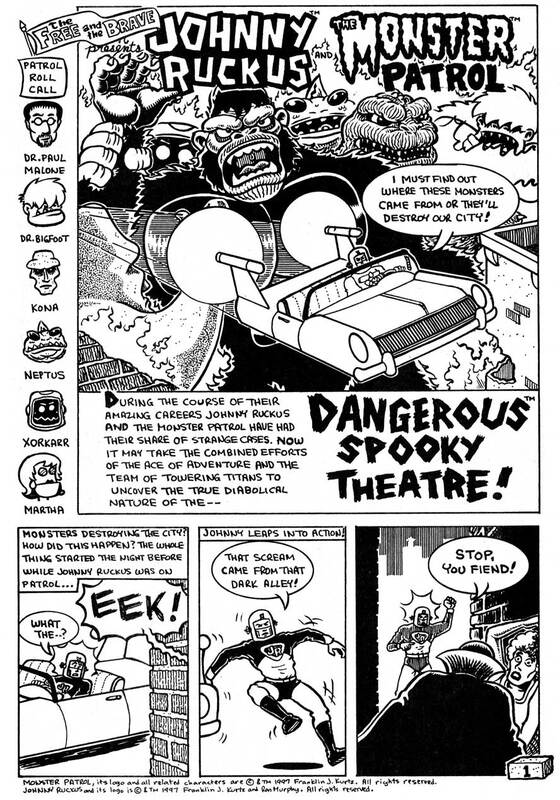 In addition to Johnny Ruckus and Monster Patrol, Frank created and later self-published the Creepsville comic book. Kurtz was managing editor of HERO Illustrated magazine in the 1990s, co-creator of Monsterscene magazine, as well as co-writer and co-director of the horror film Carnivore. 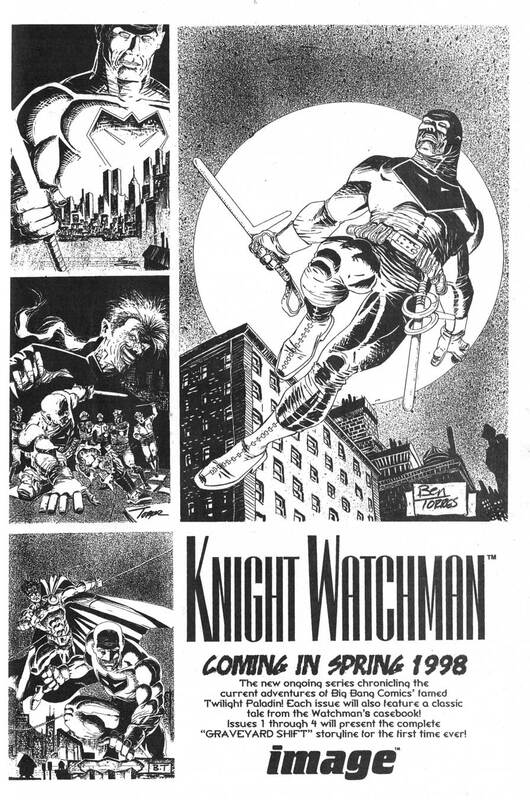 Rounding out this issue was an ad for the Knight Watchman: Graveyard Shift mini-series by myself, Chris Ecker and art by Ben Torres, as well as a back cover touting the next issue starring the Shadow Lady in “Murder By Microphone” promising Thrills, Mystery and Glamour! Be here next time to see how Jerry delivered. Big Bang Comics and all related characters are © and TM Gary S. Carlson and Chris Ecker. Shadow Lady is © and TM Jerry Acerno. 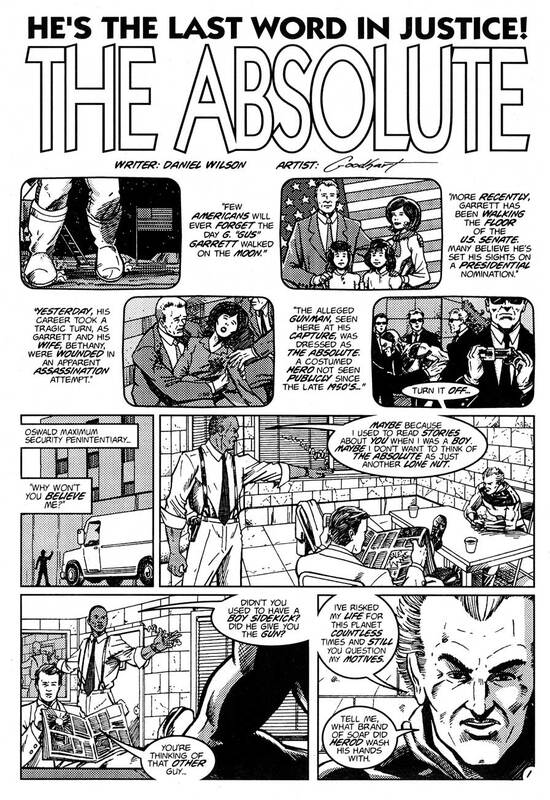 The Absolute is © and TM Daniel Wilson and Darren Goodhart. Bog is © and TM Ryan Brown. Johnny Ruckus is © and TM Franklin J. Kurtz and Ron Murphy. Monster Patrol is © and TM Franklin J. Kurtz.